I love visiting San Antonio, a charming city full of history and tradition, part Spanish, part Victorian, part German, and wholly Texan. Most people who visit San Antonio head straight for a stroll along the River Walk and a photo op at the nearby Alamo, but San Antonio de Bexar has a lot to offer; having been there and done that, John and I now prefer to spend our time in San Antonio doing "architectural tourism" and eating at quaint neighborhood cafes in the King William neighborhood - we recommend Mad Hatters for breakfast and Azuca for a Latin fusion dinner and live salsa music and dancing. In this trip we joined other visiting Houstonian friends, Landscape Architects Frank Brown and Mark Scioneaux, and had the opportunity to explore the city from a garden point of view, stopping along the way for Frank to take pictures of exotic plants and intricately wrought gates. Frank and Mark also introduced us to Alamo Heights, a beautiful neighborhood set under the shadow of centenary oaks and gently rolling hills. House in Alamo Heights, San Antonio, Texas. 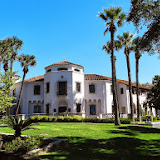 The McNay Art Museum in San Antonio, Texas.